International flower delivery makes you part of your loved ones' hearts, even when they're far away. As a family-owned business, daFlores.com has its feet in both the world of hearts and the world of business, and our service can help you in both. International flower delivery brings you closer: Whether it's anniversary greetings or cheerful holiday bouquets, daFlores international flower delivery company has the choices you need. It's true that absence makes the heart grow fonder, but too much distance might just make the heart forget. That's why we're in the business of bringing your loved ones smiles. 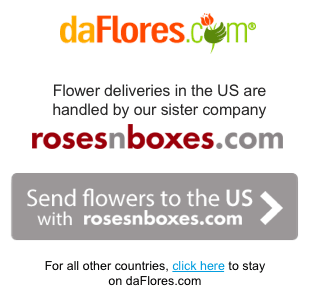 International flower delivery for companies: Here's another way to use the daFlores.com service. You can send tasteful tropical flowers to your business customers, showing appreciation and the spirit of cooperation. We ensure our hand-chosen flower shops always use fresh flowers daily, so you can trust us to impress your clients – and employees. Satisfaction guaranteed: Every element of the daFlores.com international flower delivery service meshes to bring you 100 percent satisfaction. It's not just that we guarantee your satisfaction, it's that we also translate our website into multiple languages and offer around-the-clock, bilingual customer service. Ordering is easy: Just select a country and language, browse through our intuitive categories and select the perfect arrangement. A passion for flowers: Flowers aren't just a business for us. We live, breathe and sleep beautiful flowers. daFlores understands how deeply important it is to have bright colors and fresh, crisp blooms that last a week or longer. That's why we're always out and about, locating the absolute best florists in Europe, the Americas and Asia. Our ever-expanding floral world means that you can stretch out your heart and send the best, most amazing international flower delivery.